Here are some reviews from summer camp directors who brought Jesse in as their camp pastor/speaker…..
….Even though he has been to Highland Lakes Camp many times – he is always ‘fresh’ in presenting the Gospel to our children. The one thing which sets Jesse apart is his desire to provide continuity with the camp theme. He will reiterate what the children have learned in Bible study sessions (which are taught by our adult leadership team) with what he is teaching during the evening worship services. He will also be creative in how he teaches our children the theme memory verse. It is obvious that he spends time in prayer and preparation before arriving at HLC…. 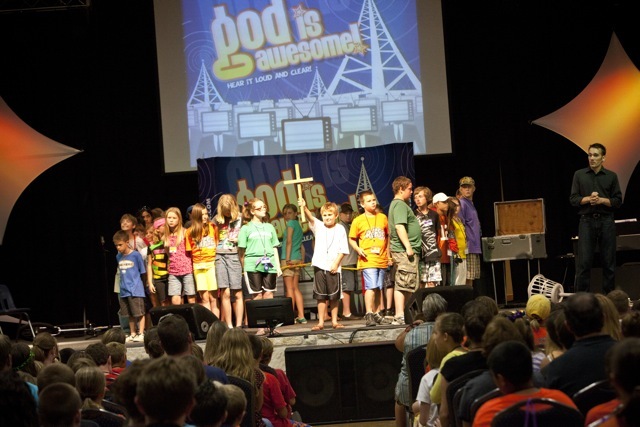 Our preteens experienced authentic worship this summer, like never before. Jesse cast the net, and the children responded in a powerful, prayerful way. Our adult sponsors were blown away! Just absolutely love Jesse. Also his precious family (Sarah and Kezzie) were here with us this summer! Thanks for all that you do. It is always our privilege to partner in ministry with For His Kidz. Once again, Jesse the “Juggler” Joyner did an outstanding job as our camp pastor/teacher for our preteen children. Jesse is able to bring the message of Jesus to a level the children clearly understand. His use of his talent in juggling (etc) kept the children both entertained and listening to what he had to say. Jesse was willing to go the extra mile with the children to make friends with them and maintain a relationship that let him teach them. He and his intern Jacob worked very well together. If someone is interested in a good speaker for children or teens, they could not go wrong with Jesse. We have used him these past two years to speak at AIM CAMP. Thanks to FOR HIS KIDZ for their part in helping facilitate the booking and planning in coordinating with Jesse and others. They are a pleasure to work with and have a “stable full” of quality individuals to speak and work with camps. Jesse is a unique speaker for summer camps, weekend retreats, and other get-away experiences. He opens the Bible in ways that captivate and engage the campers, giving them opportunities to make life-changing decisions and commitments towards Jesus Christ.